Hallmark Channel is making an unusual move. They’ve decided to change their Signed, Sealed, Delivered series from a regular weekly series to a series of two-hour movies on sister channel Hallmark Movies & Mysteries. The first new movie — Signed, Sealed, Delivered For Christmas — will air on November 23rd. Three more films are expected for 2015. Crown Media Family Networks announced today that Hallmark Channel original weekly scripted series, “Signed, Sealed, Delivered,” executive produced and written by Martha Williamson (Executive Producer of “Touched by an Angel”), will move to sister network Hallmark Movies & Mysteries as a movie franchise consisting of a series of two-hour original films. Debuting on November 23 at 9pm ET/PT, 8C, “Signed, Sealed, Delivered For Christmas” will be the first movie in the franchise, with three more slated for 2015. Hallmark Movies & Mysteries will introduce viewers to the “Signed, Sealed, Delivered” franchise by airing a marathon of the series on Saturday, October 11 from 11am – 11pm ET/PT, 10C. 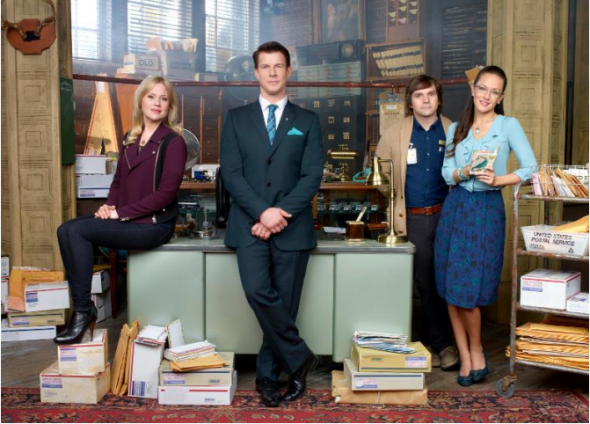 Returning as the “POstables,” Oliver O’Toole (Eric Mabius, “Ugly Betty”), Shane McInerney (Kristin Booth, “Orphan Black”), Rita Haywith (Crystal Lowe, “Smallville”) and Norman Dorman (Geoff Gustafson “Primeval: New World”) will take millions of viewers on new adventures as they uncover the mysteries of lost missives and return them to their intended recipients, profoundly changing lives in the process. “Signed, Sealed, Delivered” is a comedic drama that follows the lives of a group of postal workers who transform themselves into an untraditional team of detectives to track down intended recipients of undeliverable mail. Their missions take them out of the office into an unpredictable world where redirected letters and packages can save lives, solve crimes, reunite old loves and change futures by arriving late but somehow on time. “Signed, Sealed, Delivered” is a Muse Entertainment production in association with MoonWater Productions. Executive Producers are Martha Williamson (“Touched by an Angel”), Joel S. Rice (“Cyberbully”) and Michael Prupas (“The Kennedys”). Harvey Kahn (“The Haunting Hour”) is the producer. Recently rebranded from Hallmark Movie Channel, Hallmark Movies & Mysteries is a 24-hour digital cable network featuring a unique mix of content, including all new original movies that are dramatic, cinematic and thought-provoking; new original mystery movies that focus on the lighter side of the suspense genre, as well as classic acquired series such as Murder She Wrote, Matlock, and Perry Mason. The network is also home to annual holiday programming franchise, the Most Wonderful Movies of Christmas, as well as presentations from the award-winning Hallmark Hall of Fame library. One of television’s leading destinations for compelling family-friendly entertainment, Hallmark Movies & Mysteries can be seen in 55 million homes in SD (Standard Definition) and HD (High Definition) and remains one of the fastest-growing networks in cable. Along with sister network, Hallmark Channel, Hallmark Movies & Mysteries is the second linear channel from Crown Media Holdings, Inc.
What do you think? Is this a good move? Would you prefer that it continue as a weekly series or are you okay with a series of movies instead? Gregory Harrison played the dad. Years ago he played Gonzo Gates on Trapper John MD.